Like we said earlier, the Censor Board of Film Certification has cleared Vijay‘s ‘Theri‘ with a clean ‘U’ certificate without a single cut, team officially confirms. Same is the case for the film’s Telugu version ‘Policeodu’. Following this, both the versions are gearing up to hit the screens on April 14. Meanwhile, in a surprise gift to Vijay fans, music composer G V Prakash Kumar has added one more track to the album. “A bonus little song In the last reel of #theri added in bgscore .. Bgscore completed and handed .. #dubtheristep at imp places will shine”, he posted on his online page. 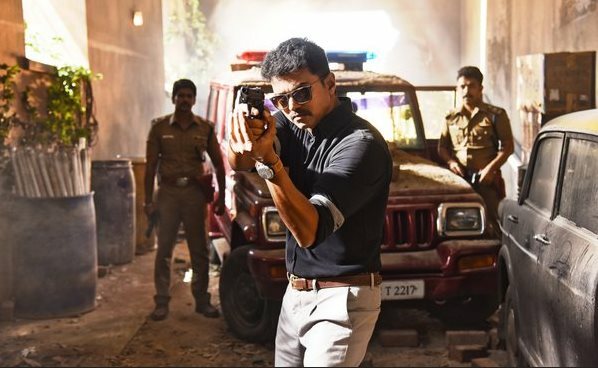 A police story written and directed by Atlee and produced by Kalaipuli S Thanu, ‘Theri’ is much awaited by Vijay fans. Samantha and Amy Jackson are the heroines, while Mahendran, Prabhu and Raadhika Sarathkumar amongst others form an ensemble cast. Featuring music composed by GVP and cinematography handled by George C Williams, Theri will have a grand theatrical release on Tamil New Year’s day. Vijay fans are making big arrangements to celebrate its release.